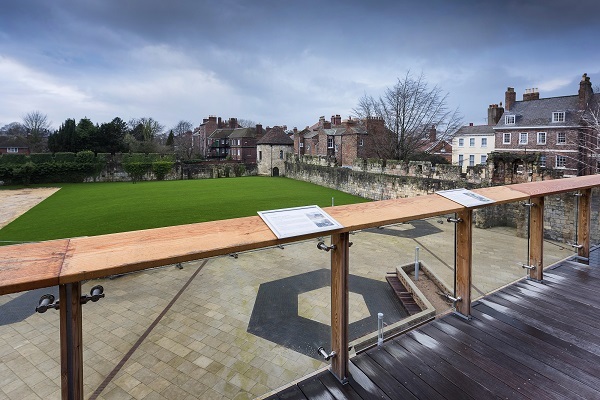 The Artists Garden is situated within the original abbey walls at the rear of York Art Gallery. Together with the Edible Wood, it was created to coincide with the gallery’s £8 million development. The site is used to display contemporary art for free. The two acres of land were previously closed off to the public but now link with the original York Museum Gardens and through to Exhibition Square via a new snickleway to the side of the gallery. Museum Garden opening times apply. Foundation Myths was the first commission for the site and officially opened on 18 August 2016. The installation was created by Charles Holland of Ordinary Architecture, an art, architecture and design practice with an international profile. The installation, produced especially for the Artists Garden, drew on the rich history of the site and its many uses over the centuries. Visit the York Art Gallery website here to find out more. The second installation in the Artists Garden was Leisure Land Golf by Doug Fishbone, which was open 3 June to 3 September 2017. The gallery successfully raised over £10,000 to loan the installation with an Art Happens campaign (Art Fund’s crowdfunding platform). The installation comprised of seven fully playable golf holes, each designed by a different artist. Find out more about the installation here.